There’s something odd about FEW. It’s not the packaging, with its turn-of-the-19th-century vibe. It’s not its spirit offerings. After all, there’s nothing particularly new and/or edgy about gin, bourbon, rye, et al. It’s not even the price (with their gin around $40 up to their eyebrow-raising $60 rye offering), which could easily cause the casual drinker to keep reaching past that bottle of FEW Spirits for their McCormick vodkaginwhiskey. No, what makes FEW odd is it’s sheer, utter impressive ballsiness. From start to finish, each of the offerings that FEW has put out into the market are unlike any other spirit that’s crossed your palate. And that’s just how founder/distillery Paul Hletko likes it. 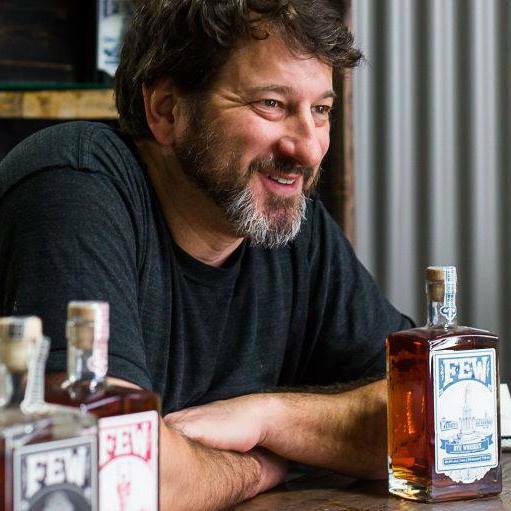 FEW seems to have embraced that uniqueness, and it looks like they’re forging their own path in a world of mountebank distillers scrambling for the claim of “small batch” and “craft” distilling. Not that Paul and his team set out to throw shade on the giants of the liquor world. Paul just likes to think that if you’re going to say that you’re small batch, you should probably take the challenges with the benefits of one of cocktail culture’s hottest trends. It’s a dedication that has taken Paul and his staff of 13 to some pretty impressive feats. From concept to current distribution, FEW has been making waves for about four years now. Tasting your way through the full FEW stable, it’s increasingly clear why the brand has been able to attract some of the best and brightest in the cocktail world. See our reviews each of the offerings to see why we think FEW may be one of the best distilleries out there now. For Paul and his crew, more than anything it’s a way to do something that matters while having fun. Check back throughout this week as we feature FEW Spirits throughout the next week, and even mix it up with them.